The Australian Open is known as the ‘Happy Slam’ but ever since news of Andy Murray’s forthcoming retirement broke last Friday, there’s been a somewhat somber mood at Melbourne Park. I got to watch Murray’s first-round match against Roberto Bautista Agut from the photo pit on Monday and it was arguably the most emotional four hours I’ve ever experienced on the job. The photo pit is as close as you can get to the players on court, and it also positions you in a way where you feel you’re at the centre of the whole arena. I was relatively close to Murray’s box that included his mother Judy, his brother Jamie, his coach Jamie Delgado, his physical trainer Matt Little, his agent Matt Gentry and other members of his team along with his former hitting partner Dani Vallverdu (now Grigor Dimitrov’s coach), young British player Katie Swan (who is represented by Murray’s management company) and many others who all turned up for what might have been the very last match of his career (that fact remains unclear). The crowd was like nothing I’ve ever witnessed live in tennis. Melbourne Arena (formerly Hisense) is a special stadium that is partly ticketed and partly open to the public. It’s perfect for matches with a rowdy atmosphere and it’s where I once watched Nick Kyrgios come back from two sets down to defeat Andreas Seppi back in 2015. I thought the crowd that day was the loudest I’d ever seen. It was even more electric for Murray on Monday. After tearfully explaining to us on Friday that the “pain was too much” and his hip was ending his career, Murray had us all invested in his every move on court against the relentless Bautista Agut. “Of course I watched it, I think everyone watched it,” said Novak Djokovic on Tuesday of that Murray match. It wasn’t emotional because it was potentially Murray’s last match, it was emotional because of the grit and fight he showed on each point, despite the pain he was so obviously in. I kept looking up to see the reaction on Judy’s face every time he lunged for a ball or sprinted from one side of the baseline to the other. She would go from peak stress to utter jubilation within seconds, as Murray laboured for every point. 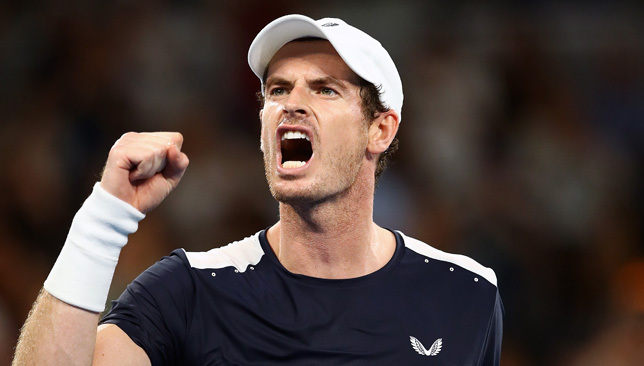 It wasn’t looking good for the Scot when he dropped the opening two sets but buoyed by the bellowing crowd and an emotional charge that can boost an entire power plant, Murray rallied. Before he lost in five sets, serving at 1-5 in the decider, the entire arena gave him a standing ovation – the applause was literally deafening. Murray stopped before he was about to serve and thanked them, Judy was tearing up, I honestly felt that the whole place was shaking. It was a moment that summed up the entire match. We thought that was going to be the end of it. No way Murray can hold serve after that emotional ovation, and after running for the past four hours. But he did, and he forced Bautista Agut to serve out the win, because that’s what Andy Murray would do. “I was emotional at that moment. It was cool. I don’t think I’ve had that before in any matches,” said Murray of that standing ovation at 1-5. Whether he plays again or not, that hot and humid day at Melbourne Park is one we’ll never forget. It was bagels galore in the first round with Maria Sharapova crushing British qualifier Harriet Dart 6-0, 6-0, Serena Williams ousting Tatjana Maria 6-0, 6-2, and Timea Bacsinszky posted a virtual double bagel, losing the first three games against Daria Kasatkina before winning 12 game s in a row for a 6-3, 6-0 success. Last year’s semi-finalist rallied back from two sets down for the first time in his career to defeat Bradley Klahn 6-7(5), 6-7(5), 6-3, 6-2, 6-4. A much-needed win for the South Korean, who is defending a lot of points this fortnight. Kei Nishikori and Pablo Carreno also escaped early exits by rebounding from two sets down. – Murray wasn’t the only one to shed tears in the press conference room these past few days. Victoria Azarenka cried at the end of her chat with the press following her first-round loss to Laura Siegemund on Tuesday. The Belarusian is struggling to find her form and admits she’s not sure what the solution is. – Nick Kyrgios managed to avoid questions about a rumoured rift within the Aussie Davis Cup camp. Here’s how that conversation unfolded. Kyrgios: Is there an echo in here? – While fielding questions in her last-night press conference on Tuesday, a Japanese journalist asked Naomi Osaka how much she weighed. She laughed and said: “Wouldn’t you like to know? I don’t know, I haven’t weighed myself in a while. You shouldn’t be asking people’s weight like that. I don’t know, though.” She took it all in good humour. – Wondering what to call the green romper Serena Williams wore in her opening round? Is it a romper? Is it a onesie? Is it a leotard? She chose to go with ‘Serena-tard’. There were quite a few retirements in round one but the ones that stood out were Thanasi Kokkinakis and Ernests Gulbis who both had to retire from their matches due to injuries (pectoral for Kokkinakis, back for Gulbis), despite leading their opponents by a set. It was particularly unfortunate as both players are trying to fight their way back up the rankings and have shown decent form as of late. It also made for some more emotional viewing at the ‘Emo Slam’. Feisty American Danielle Collins took out Auckland champion and No. 14 seed Julia Goerges in three sets while 21-year-old American Reilly Opelka edged past fellow big-server, No. 9 seed John Isner in a tiebreak fest. Contesting his fifth consecutive Australian Open main draw, No. 11 seed Borna Coric finally notched his first match-win at the tournament after losing his first round in each of his last four visits here. Canadian 18-year-old Bianca Andreescu, who opened her 2019 season with a brilliant week in Auckland, where she reached the final as a qualifier, has kept up her form by qualifying for the Australian Open and winning her main draw first round on Tuesday. Her victory over 16-year-old Whitney Osuigwe gave Andreescu her first-ever Grand Slam main draw win. 2 – Tatjana Maria hit just two first serves in her first set against Serena on Tuesday. She lost both of those points. 2:08 – am, the finish time for Dominic Thiem’s five-set win over Benoit Paire in the wee hours of Wednesday morning. 11 – wins against just one loss for Andreescu in 2019 (qualifying and main draw). 39 – year-old Ivo Karlovic became the oldest man to win a match at the Australian Open since Ken Rosewall in 1978. The Croat defeated Next Gen player Hubert Hurkacz in four tiebreak sets. 87 – combined aces struck in the match between Opelka and Isner. 90 – per cent, Milos Raonic’s success rate on his first serve against Nick Kyrgios. 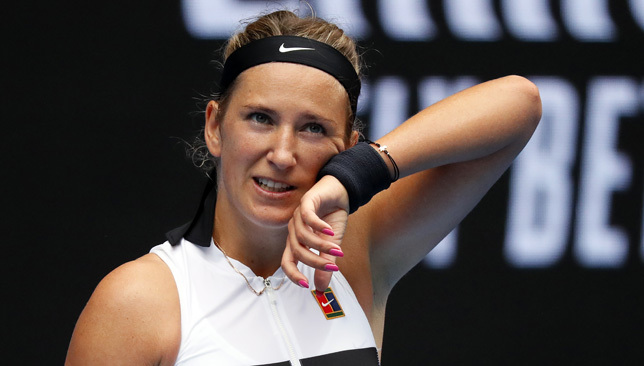 A tearful Victoria Azarenka admits she is “struggling” to reclaim her confidence on the court after suffering a first-round exit at the Australian Open on Tuesday. The former world No. 1 and two-time champion in Melbourne had to stop towards the end of her press conference as she got emotional while discussing her current troubles. “I’ve been through a lot of things in my life and sometimes I wonder why I go through them, but I think they’re going to make me stronger, I want to believe that and I’m going to work hard for it. 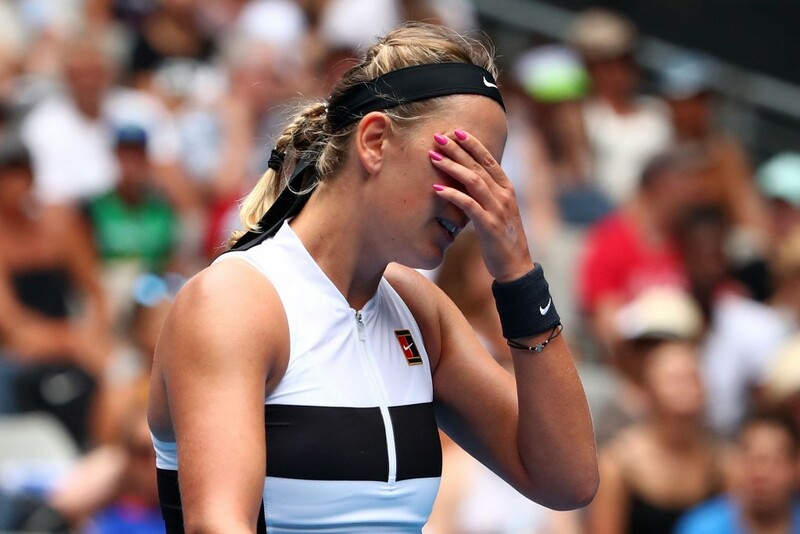 Sometimes I just need a little time and patience and a little support,” said Azarenka, while fighting back tears, after her 6-7(5), 6-4, 6-2 loss to Laura Siegemund. Ranked 53 in the world, Azarenka hasn’t been able to recapture her previous top-10 form since returning from maternity leave in June 2017. Off-court problems that included a custody dispute with the father of her child have interrupted her scheduling over the past year and a half. She started 2019 with two opening round losses in Auckland, and now Melbourne, and confessed it’s been difficult trying to translate her level from practice to matches. Azarenka acknowledges that she is low on confidence at the moment and says it’s tricky finding it in matches. “If there’s a store where you can buy it, I’ll go purchase it,” she says when asked how she can get back her confidence. 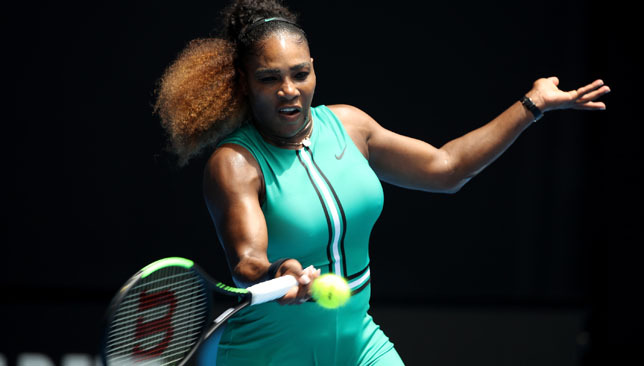 Serena Williams made an emphatic return to competitive tennis at the Australian Open. The American’s clash with fellow mother Tatjana Maria was her first outside of exhibition events since the tumultuous US Open final last September. But, while the events of that day still generate plenty of interest, Williams is focused firmly on trying to secure that elusive 24th grand slam singles title. This was certainly a great start, with the 37-year-old, dressed in a striking green playsuit, taking just 49 minutes to come through 6-0 6-2. German Maria won only five points in an 18-minute first set but made a better fight of it in the second. The result extended Williams’ winning streak in Melbourne to eight matches following her title in 2017, and she said: “I think the last time I was here I was pregnant and playing, which is insane, so it’s kind of weird walking back on – by myself this time.